We always hope that there’s never an emergency at our facilities but hoping to avert a crisis will not protect us from one. 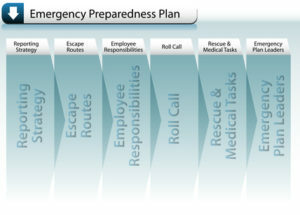 Creating a good emergency plan for your facility is a necessary step in dealing effectively with an unforeseen event. We’re going to discuss what types of emergencies you should plan for, what a good emergency plan should include, and what types of practice and drills you and your colleagues should do in order to prepare for an emergency. Knowing that you have an operative emergency plan in place will give you peace of mind, and if the unthinkable happens, you will know that you are prepared. What types of emergencies require plans? The Occupational and Safety Health Administration (OSHA) describes an emergency as any unexpected situation—whether natural or manmade—that causes or necessitates your place of business to cease operating; that poses a danger to employees, customers, clients, the general public; or that causes physical or environmental damage. While some of these events might seem to you more likely to occur than others, being aware of numerous dangerous situations means that you can take them into account as needed when making your emergency plans. OSHA’s Safety and Health Topics portal provides links to pages focusing on many of these specific incidents. What should a good emergency plan include? Now that we’ve addressed potential emergencies, let’s talk about what your emergency plan should include. Each of your facilities (should you have more than one) needs to have its own plan. It’s also helpful to establish the location to which employees will evacuate and to have a procedure in place for accounting for everyone. Mandate that the alarms must be perceived by everyone in the workplace. This means considering employees with disabilities or other conditions that might impact their abilities to perceive an alarm. OSHA suggests implementing tactile devices to render alerts for those who might not be able to perceive an audio or visual alarm. Your emergency plan might also include people who are designated to assist those with disabilities and those who do not speak English. You may want to use a risk matrix analysis to identify hazards that are normal occurrences and those with a low probability for a specific facility. That’s the time to think about the above emergencies, too. Fire is among the more common emergencies that can occur anywhere. On the other hand, a hurricane is not going to affect facilities in the middle of the country the same way that it will affect facilities in the southern and eastern parts of the country, if at all. Keep in mind, however, that it is virtually impossible to predict every single kind of emergency that may occur at one of your facilities. It is useful to know what hazards are most likely to occur. Good emergency plans are “response-based,” and focus on the actions that employees, customers, clients, and guests should take, regardless of the type of emergency. Depending on where your facilities are located in relation to police, fire, and emergency medical services, and the nature of an emergency, it may take time for first responders to arrive and offer assistance. In an emergency, every minute counts. Designate an immediate responder network of crisis managers at each of your locations. Each building should have a single point of contact, and others should be designated to assist in emergencies to make sure that established protocols are followed: Should a building be evacuated during an emergency, or will everyone shelter in place, for example. Crisis managers should be trained regularly in the company’s policies and procedures, first aid (including CPR and AED training), National Incident Management System (NIMS), and incident command and threat awareness/indicators. Everyone who is a designated responder may want to take NIMS courses. The National Incident Management System was designed after the terrorist attacks on September 11, 2001, and are protocols used government-wide for responding to any kind of emergency. It is important to understand that emergency procedures are only useful if everyone can implement them properly. This will require planning, discussion, and making sure that everyone is familiar with the plans before they need to be put into action. During “tabletops,” employees work together in small groups to talk through an emergency response scenario offered by a facilitator. The facilitator should also suggest additional circumstances which will necessitate the groups to strategize quickly “on their feet” as they would need to in an actual emergency. During drills, specific circumstances are created to which employees must physically respond. The most common of these is a fire drill, which should be coordinated with the local fire department so it is aware that a drill is taking place. Exercises are more complex than drills and often involve multiple buildings, and perhaps multiple local agencies. They may be somewhat scripted, in that specific individuals will respond to whatever the emergency is in certain ways. As much as possible, a planned response should be included to elements that are counter to the normal. Regardless of which of these three kinds of activities you plan for your employees, debriefing sessions afterward to review encountered problems, concerns, and suggestions should be held so that emergency plans can be updated accordingly. What types of practice and drills are helpful? Your emergency plan can include directions for when these kinds of responses are necessary. Employees should be trained in the specific responses required for each. Drills should be unannounced, should only be one specific type at a time, and should be enacted under different conditions—for example, different times of day, in different weather conditions, and when certain key personnel is absent. OSHA offers free, confidential, on-site consultations to small and medium businesses in all 50 states, the District of Columbia, and certain territories through its On-Site Consultation Program. An OSHA inspector will visit your facility and perform a walk-through with you, noting any hazards, and share suggestions to improve any work-safety programs that you already have in place. No penalties or citations will be issued during the visit. Use the form on the OSHA Consultation Directory page to find the contact information for the Consultation Program in your area.